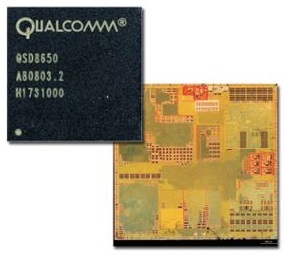 Qualcomm just shipped the first dual-core smartphone processor, a 1.2 GHz Snapdragon chip. The new third-generation QSD8260 and 8660 chips are based on a die-shrunk 45nm version of the 1 GHz QSD8250 chip found in phones like the HTC HD2, EVO 4G, and Google’s Nexus One and should use less power while packing a lot more computing horsepower. The third-generation Snapdragon CPUs offer a next-generation Adreno (ATI Imageon) GPU with support for Open GL ES 2.0 and Open VG 1.1, hardware acceleration for 1080p HD video encode/decode, and video output resolution up to WXGA (1280×800) with 24-bit color. They also pack a dedicated low power audio engine (to allow the rest of the CPU to go to sleep when you’re just playing music) and low power GPS electronics (to reduce power consumption in navigation apps). The 8260 model packs an HSPA+ radio (GSM), while the 8660 supports both HSPA+ (GSM) and EV-DO Rev. B (CDMA). Qualcomm will also offer the QSD 8672, a 1.5 GHz version for tablets and larger devices that began sampling several months ago. The CPUs are based on the same Scorpion core design as current Snapdragon chips, implementing the ARMv7 instruction set but offering slightly better performance clock-for-clock than ARM’s reference design, Cortex A8. For more information, check out our Smartphone Processor Guide. No info on when the new chips will hit production smartphones, but we’re probably looking at early 2011 at the earliest. TAIPEI, Taiwan – June 01, 2010 – Qualcomm Incorporated (Nasdaq: QCOM), a leading developer and innovator of wireless technologies, products and services, today announced the Company has sampled its first dual-CPU Snapdragon™ chipsets. The Mobile Station Modem™ (MSM™) MSM8260™ and MSM8660™ solutions integrate two of the Company’s enhanced cores running at up to 1.2GHz. Targeted at enabling high-end smartphones, the MSM8x60 solutions are third-generation chipsets from the Company’s expanded Snapdragon platform, which has been powering smartphones, tablets and smartbook devices in markets around the world.